What happens after surgery matters almost as much than what happens during surgery. Sometimes, it even matters more! No matter how skilled your surgeon may be, his or her hard work can always be undone if their patient doesn’t follow directions, doesn’t protect their healing foot, and doesn’t follow through with rest and rehab. When it comes to recovering from foot surgery as well as possible, there’s one master rule: Listen to your surgeon! The instructions and guidelines are there for a reason. You might not always understand what a rule is there for. (If you don’t, please ask!) Furthermore, you might decide you feel fine, that the recovery seems to be going better than expected, and surely it won’t hurt to start weight-bearing a little early, won’t it? Don’t do this! Just like you, we’re totally focused on healing your feet as quickly as possible. That’s why it’s important to follow our directions as closely as possible throughout the recovery process. Of course, every surgery and situation is a little different, so there’s no way to give you an exact breakdown of what your specific recovery will look like. That said, read on to review some common components, or review this document for some additional details. There will likely be a period of time where you’ll have to stay off your feet (avoiding all weight bearing) and keep them elevated when possible. People, in general, aren’t much good at accurately gauging the amount of force they’re placing on their feet, and even a little bit can significantly impair wound healing. The first follow-up appointment is usually scheduled for about the one-week mark after surgery. 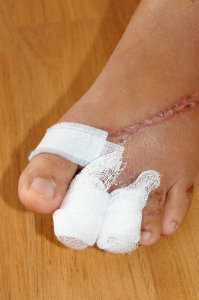 Depending on the seriousness of the surgery, you may require a cast, a walking boot, or even one followed by the other. Crutches, a wheelchair, or other assistive devices may be provided if necessary. Over time, you will make a slow transition to a boot walker and regular shoes, and will gradually be cleared for a greater variety of weight-bearing activity. Don’t try to do too much, too soon. During the immediate healing process, muscles and other tissues may have lost strength or range of motion. Once you’re ready, physical therapy and rehabilitation exercises may be necessary to get your feet, ankles, and legs back to 100%. In the end, of course, it all comes back to following instructions. We’re here to guide you through this process, but ultimately the success of a surgery often comes down to you. Take your recovery seriously, and you have the best chance of a fully return in the shortest possible time. To schedule your appointment, give Dallas Podiatry Works a call today at 972.566.7474.